Cllr Martin Wise writes to offer me an alternative view on the "Flower bed" saga found on Cllr.Mark Nottingham's blog where his colleague Labour Councillor Clive Hart, is featured criticising a decision on the part of the council's gardeners, to reduce the number of flower beds on Cliftonville's Eastern Esplanade. 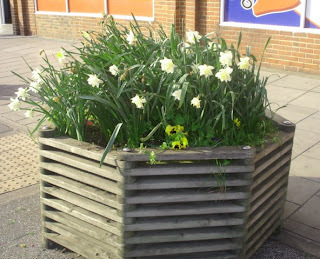 Clive's frustration doesn't seem to reconcile well with the visible neglect of the flower tubs in other parts of his ward (seen below) where he states:"Fostering a sense of local pride is a key objective". Contrast this statement with the quieter actions of the community spirited Cllr.Wise, of East Cliftonville, who has adopted the much larger planter outside Tescos in Northdown Road, - the first photo at the very top of this column - and who has maintained it at his own expense for a number of years despite the regular loss of much of the planting to light (never mind green) fingered passers-by. Actions speak louder than words and perhaps the state of the flowertubs in Cliftonville mirrors the fortunes of the two main political parties. You might be forgiven for thinking so. The Hanging Gardens of Babylon perhaps? 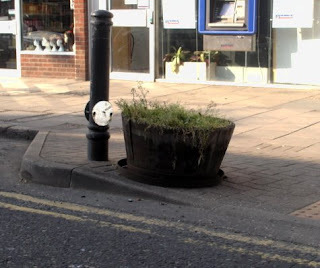 Very public spirited of Cllr Wise, but whilst he may well pay for upkeep of the odd flower pot, don't forget that I along with other taxpayers also contribute by paying toward what some would see as rather generous expenses. I'm not entirely sure what constitutes "generous" expenses in this example. Are you referring to a cabinet member's allowance? At Saint Pauls we try and keep our flowerbed well stocked and tidy which is a full time job. Next time I am in Northdown road I will have look see if the half barrels have been sorted they look in need of a full makeover. In Westgate, the flower baskets usually appear in the main street, but despite many requests, the shops and streets South of the Canterbury Road get nothing! I suppose it depends how close you live to a councillor. And as our nearest Councillor South of the Canterbury Road, lives in Birchington ( Get your facts right Doc! ) I suppose we will still remain the poor relations!